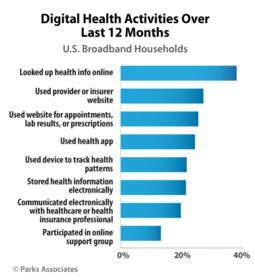 DALLAS, TX--(Marketwired - Jul 22, 2014) - In the last 12 months, 38% of consumers in U.S. broadband households looked up health information online, and 27% used the website of their care provider or insurer, according to research from Parks Associates. Jennifer Kent, Senior Analyst at Parks Associates, will discuss the implications of current consumer attitudes and behaviors in connected health during the session "Increase Patient Adoption of Digital Health Practices to Promote Patient Self-Management" at mHealth + Telehealth World at the Hyatt Regency, July 22-24 in Boston, MA. mHealth + Telehealth World is a three-day event for healthcare executives interested in learning how to utilize telehealth programs most efficiently as well as what health practices can improve patient outcomes. Parks Associates' health analyst team recently addressed the health and wellness aspects of the wearables market during the industry webcast "Engaging Consumers with Connected Health Technologies." In the webcast, available for download at the Parks Associates website, the analysts highlighted consumer research to inform best practices for engaging different types of digital health consumers and producing improved care outcomes. Parks Associates will host the inaugural Connected Health Summit: Engaging Consumers in San Diego, September 4-5, featuring keynotes from Ascension Health, Humana Wellness, Kaiser, Qualcomm Life, and Walgreens. Jennifer Kent is available for media interviews at mHealth + Telehealth World. To request a meeting or specific research data, contact Holly Sprague at hsprague@gmail.com or 720-987-6614. "Engaging Consumers with Connected Health Technologies."